Abstract: I will lead a conversation about some potential applications of discrepancy theory and pseudo-randomness to experimental design. I will explain these concepts, the state of current algorithms for minimizing discrepancy, and what is known to exist by my resolution of the Kadison-Singer problem with Marcus and Srivastava. I hope this will be a conversation, because I will assume the audience has not encountered discrepancy theory and I do not know much about experimental design. 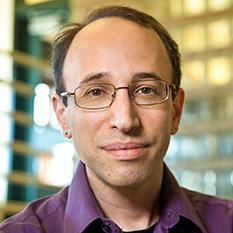 Daniel Spielman received his B.A. in Mathematics and Computer Science from Yale in 1992, and his PhD in Applied Mathematics from MIT in 1995. He spent a year as a NSF Mathematical Sciences Postdoc in the Computer Science Department at UC Berkeley, and then taught in the Applied Mathematics Department at MIT until 2005. Since 2006, he has been a Professor at Yale University. He is presently the Sterling Professor of Computer Science, and Professor of Statistics and Data Science, and of Mathematics. Professor Spielman has received many awards, including the 1995 ACM Doctoral Dissertation Award, the 2002 IEEE Information Theory Paper Award, the 2008 and 2015 Godel Prize, the 2009 Fulkerson Prize, the 2010 Nevanlinna Prize, the 2014 Polya Prize, an inaugural Simons Investigator Award, and a MacArthur Fellowship. He is a Fellow of the Association for Computing Machinery and a member of the National Academy of Sciences and the Connecticut Academy of Science and Engineering. His main research interests include the design and analysis of algorithms, network science, machine learning, digital communications and scientific computing.